Saturday 22 October afternoon saw a huge crowd filling Hotel Boscolo Exedra’s Michelangelo Hall in Rome, eager to hear the latest about distribution in the European Union, thanks to a panel powered by Europa Distribution and MIA – Cinema. The latter is a branch of MIA, Mercato Internazionale Audiovisivo (International Market for Audiovisual), the first Italian Market converging all the segments of the audiovisual industry. 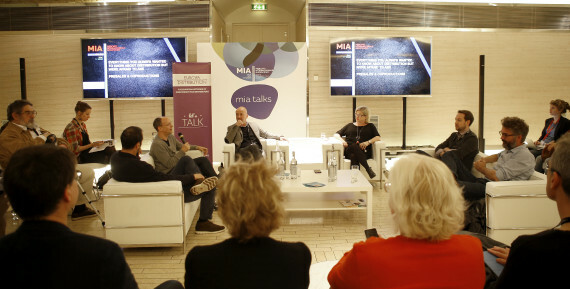 In the frame of Rome Film Festival, MIA organized a 5-day series of activities for industry professionals, including meetings, networking, screenings and talks. Among those, Europa Distribution proudly presented the third edition of “Everything you wanted to know about distribution but were afraid to ask”, this time focusing on Pre-sales and Co-productions. Europa Distribution’s very own Christine Eloy had the floor first, stressing the importance of dialogue, both between distributors and with the EU institutions, summarized in the network’s motto “Let’s talk”. Then she broke down the many tasks of an independent distributor nowadays, ranging from curating and promoting content on a national scale, dealing with exhibitors, VOD platforms and TVs, to financing, co-producing in order to stay relevant in the fast-changing audiovisual market. Five speakers were introduced shortly after by Screen International editor Wendy Mitchell, who moderated the conference. They included: Andrea Occhipinti, Lucky Red (production – distribution – exhibition), Ed Guiney, Element Pictures (production – distribution – exhibition – platform), John Von Thaden, Magnolia Pictures & Magnet Releasing (production – international sales – distribution), Michael Weber, The Match Factory (international sales – production), and Roberto Olla (Eurimages). Mitchell then kicked off the talk by inviting them to share their own experience about the way their business has changed throughout the years, in terms of pre-sales. The experts unanimously agreed that pre-sales has always been a difficult subject to cope with. Furthermore, Eurimages executive director Roberto Olla outlined 3 trends he’s been witnessing as of late: “The market has been intervening less, so we receive more projects, but the budgets are either very small or very big. Everything that’s in between is hard to get produced, and that’s due to a polarization of budgets. The third issue is the diminution of funds, which usually push filmmakers to take risks and be creative, while more and more selective schemes are coming up”. The debate went on tackling the topics of diversification, a key weapon to stay viable in the game, as pointed out by Lucky Red director Andrea Occhipinti: “We might exist with distribution only, but it’s hard – it’s healthy to diversify and to produce more and more, and having a foot in exhibition is not bad either”. “Pre-sales are tricky” stated The Match Factory managing director Michael Weber “but if the film is an instalment of a successful franchise or its director has a good reputation, it’s worth a try”. Occhipinti agreed with his colleague, stating that in the arthouse world, the director’s name is crucial. “This year we bought the latest films by Xavier Dolan, Asghar Farhadi and Stephen Frears, whose Florence Foster Jenkins has just been screened at Rome Film Festival, because their names were a guarantee. When it comes to commercial films – added Occhipinti – it’s the concept that matters: that’s the case of Shane Black’s The Nice Guys. But sometimes the script is not enough, so the audience and position on the market are also to be taken into account”. As the roundtable went on, also enhanced by questions and interventions by the audience, hotter topics came into play, such as territoriality. Olla highlighted its role as a fundamental asset for a sustainable European audiovisual eco-system, and expressed his concern at the idea of a multi-territorial licensing. This measure would reduce the acquisition possibilities to only a few distributors who can afford to buy the rights for several territories, thus making the small companies disappear. However, Eloy went on to mention a couple of recent good initiatives by the European Commission, such us the attention for diversity in broadcasted and online European films thanks to the review of the AVMS directive. When a hand was raised among the audience, the most discussed and controversial subject was eventually brought up: Netflix. Mexican producer Mayra Espinosa asked for the speakers’ guidance in regards of an issue she is currently experiencing: her film has been acquired by Netflix, which will distribute it in December, causing the film’s short festival run to stop. “Our film has only been to 2 festivals so far, and I’m afraid that in 2 months no one will be interested anymore. Is there a way to stop this?” Olla replied that new players must be embraced, even powerful ones. “It’s a matter of regulation. When TV arrived in the game, everyone thought cinema was doomed, and the same happened with VHS and DVDs. Every new form of exploitation has to participate in order to make sure that creators and people who worked for the product are paid, so that the industry stays active and the money flowing. It takes time to regulate the Internet and VOD, but it’s possible, nonetheless”. However, in some cases Netflix might represent a chance for a film to boost its popularity: screenings at film festivals and reviews are not always the only way to reach an audience. In the last part of the conference, the speakers outlined the risks and perks of being a distributor in the 2010s, as in a business SWOT analysis. The most serious threat for a company is refusing to evolve and adapt in an ever-changing audiovisual world. On one hand, Guiney asserted that producers might be the ones risking the most, as they focus on a single film for a long time with no guarantee of being rewarded. On the other hand, Occhipinti responded that distributors must constantly explore new fields and business models, as adapting is a necessity for them, in order to stay relevant in the game. The public panel wrapped up on a positive note, as the experts reflected on the benefits of living in a time of transition, where new platforms meet old ones to create more ways of distributing stories and engaging with audiences, as in the case of Netflix on TV. The immediate availability of content is another advantage we take for granted nowadays, but was unthinkable not many years ago, when people had to wait for their local theatre to organise a cinema discussion about a film from the past. A final, optimistic thought about the current state of things in the European Union was shared by Roberto Olla, who concluded: “Twenty years ago, putting together a co-production between different countries was a big challenge. Today, Europe is undoubtedly an easier place to work in: we understand and know each other much better”. And that, for instance, is the ultimate goal of Europa Distribution.